Summer is threatening to come (though it did snow earlier this week so I kind of wish it would threaten a little harder) and with it a bevy of fresh vegetables. This simple pasta dish combines a delightful mix of veggies with two different cultural flavors–the Italian-American dish of pasta primavera and the flavors of Morocco. Heat oven to 400 degrees. 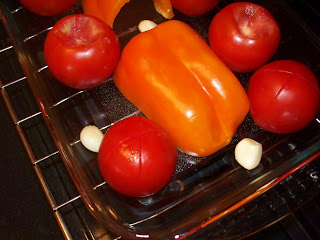 Place tomatoes, garlic cloves, and pepper halves inside a baking dish. Roast at 400 degrees for 20 minutes or until vegetables are tender. 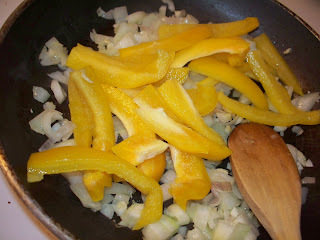 While pasta cooks and veggies roast, heat olive oil in a medium-sized skillet over medium heat. Add 1 teaspoon of each of the spices and stir, cooking about a minute. Add the onion and shallot, stir together and cook 2-ish minutes. 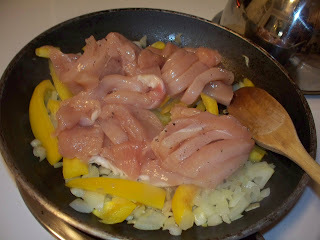 Add the pepper slices, stir together and cook another 2-ish minutes before adding the chicken strips. Cook until the chicken is cooked through, stirring occasionally. Feel free to add a little more spice (to yer taste) as the chicken is cooking. Remove the veggies from the oven and allow to cool a few minutes. Remove the skins from the tomatoes and roughly chop or smash them. Roughly chop the garlic and slice the pepper. Drain the pasta and return it to the pot it was cooked in. Place the pot on an un-used eye on the stove so as not to overcook the mix. Add the smashed tomatoes and chopped garlic and pepper. 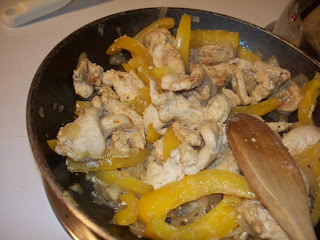 Add in the chicken/pepper mixture and stir all of it together. 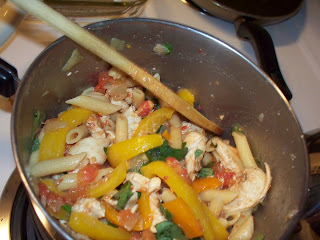 Take the fresh basil and tear pieces into the pasta mixture. Serve! 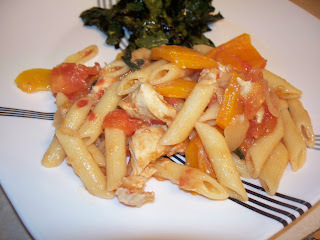 leah charney, pasta, tomatoes, vegetables. Bookmark the permalink. Post a comment or leave a trackback: Trackback URL.